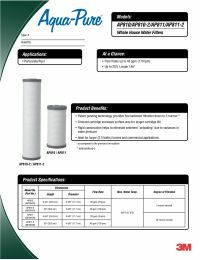 The Aqua-Pure AP810-2 Whole House Filter Cartridge is a 5 micron grooved polypropylene sediment filter with plastic end caps. The rigid construction helps eliminate sediment "unloading" due to fluctuation in water pressure. The grooved cartridge increases the surface area for longer filter life.